The official task of picking up garbage in Oakland falls to the Oakland Public Works Agency. Each year, this group of dedicated workers manages to cart off tons of trash from all public right-of-way sidewalks, roads and alleys. Not only is this all your household garbage but also trash from construction sites. If you’ve ever had the misfortune to live in a city when the garbage collectors went on strike then you know how important this service is. Without their efforts the garbage would literally be piling up in the streets. However, just because these crews are on the job doesn’t mean they can pick up everything. For some people, dumping trash by the side of the road or in an abandoned lot is no big thing. Not only is that a problem for the rest of us who have to now live with that garbage but it is also illegal. The good news is that you can do something about it. See It – Write down the dumper’s description: include gender, ethnicity, age, hair color, clothing, etc. Write down the vehicle description: include license plate number, color, make, model & approximate year, if known. Report It – Call the Public Works Call Center at (510) 615-5566. Dumping in progress should be called in to 911. Beginning on August 1, 2011, OPD will provide an on-line report process at www.oaklandpolice.com for illegal dumping that is witnessed by a citizen, but is no longer in progress. Stop It – Get involved! With your help, we can reduce illegal dumping in our communities. This really puts illegal dumpers on notice. However, this same department is also encouraging Oakland residents to report any overflow problems with garbage cans. Yes, this means if you pack up your garbage can to overflowing you could be sited and fined. This could even be an issue if you’ve got someone sifting through your garbage for recyclables and they leave trash on the ground. You could take the hit for that. There is one proactive solution you can take with regard to your large trash pickup items and that would be to hire a private company of expert junk haulers like Junk King Alameda. These are the folks who can show up at the appointed hour and take away all your oversized items like unwanted furniture and large appliances. There is no reason why you have to be stuck with this junk any longer. Hiring a private junk hauling crew like Junk King also means you’ll be working with professionals. These aren’t “day workers” who float in and out of jobs but steady employees dedicated to making sure they get the job done right. They are also fully bonded and insured. 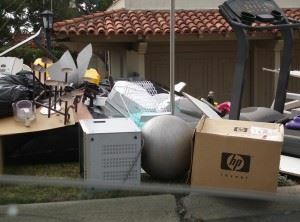 Even though they might be taking away junk, they still have to get it out of your house first without causing any damage! And just because you’ve got big items heading to the landfill or recycle center doesn’t mean you can’t load up their truck with a bunch of smaller items as well. Make this your excuse for a complete garbage overhaul of your home! This entry was posted in Large Trash Pickup, oakland junk removal, Oakland Trash Hauling and tagged Large Trash Pickup, oakland junk removal, Oakland Trash Hauling, oakland trash pickup on August 29, 2011 by Junk King. Last updated August 4, 2017 .